You probably have never heard of Dr. Benjamin Rush — the only medical doctor to sign the Declaration of Independence—and although his star has faded over time, his influence over the better-known founders was second to none. Today, when Rush’s named is mentioned, it is often in reference to his mistaken belief in the efficacy of bloodletting as a treatment for everything from Yellow Fever to mental illness. Suffering from cramps? Try letting out a few ounces of blood. For persistent headaches, maybe drain a couple of pints. In the most extreme cases, such as the mysterious and deadly virus that devastated many colonial cities in the decades following the American Revolution, Dr. Rush prescribed repeated and prolonged bloodletting of up to 75% of his patients’ blood. While his treatments of the Yellow Fever epidemic may have failed (and in some cases made his patients worse), Rush also intuited one of the root causes in the damp, filthy streets of the time. He thought the illness resulted from a toxic miasma emanating from the moisture, when in fact it was spread by mosquitos breeding in the stagnant water pools. In any event, his tireless campaigning for improved sanitation and hygiene were a major part of the solution. Like all of the Founding Fathers, Rush was a product of his time. He studied under the best and brightest, and tended to thousands of sick with his burgeoning knowledge of medicine. It’s easy to focus on his blunders, borne of the universal ignorance of doctors of his time, and look past his many accomplishments. 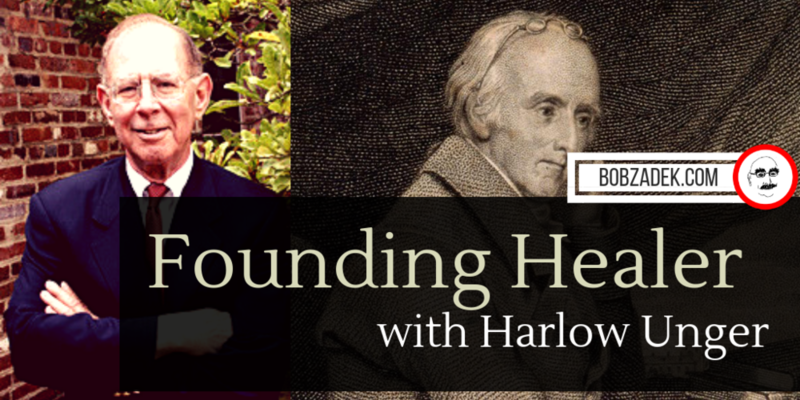 Harlow Unger, the prolific historian who has authored 10 biographies of founding fathers, has released the antidote to this one-sided treatment of a fascinating but little-known figure of American history in his new biography, Dr. Benjamin Rush: The Founding Father Who Healed a Wounded Nation. Unger records Rush’s close relationships with Benjamin Franklin, Thomas Jefferson, and John Adams, how he healed a divided nation at many critical junctures, and how his pioneering social work laid a foundation for the fulfillment of the Constitution’s promise of equal liberty for all. Unger thoroughly dispels the notion that history is all dates and names. He casts the story of Rush’s life and times in such vivid detail that the reader feels as if he was amid the horrible outbreak of Yellow Fever, which simultaneously devastated city populations along the Eastern Seaboard yet may have saved the fledgling union from a rebellion brewing in New York at the hands of French envoy to the U.S., Edmund-Charles Genet. Even the avid student of American history will learn much from Unger’s book, and my live conversation with him this Sunday — 8–9am PACIFIC—on the show of ideas, not attitude. As always, your calls are welcome at (424) BOB-SHOW.